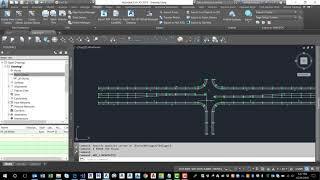 Import delimited point files (PNEZD, PENZD, etc) into Autodesk® AutoCAD® to plot points and their connected linework as 2D polylines. Linework commands are stored in the point description field. For example, edge of pavement survey points (EOP) can be coded as EOP B, to begin linework. Subsequent EOP points will be connected with a single polyline, until the EOP E command is issued. Three-point curves are also supported.